Now spectacles or glasses as they’re commonly known, have been a concern of mine for as long as I can remember. In the first instant my great , great grandfather William Howe appears in the 1835 edition of Pigot & Co’s Commercial Directory. 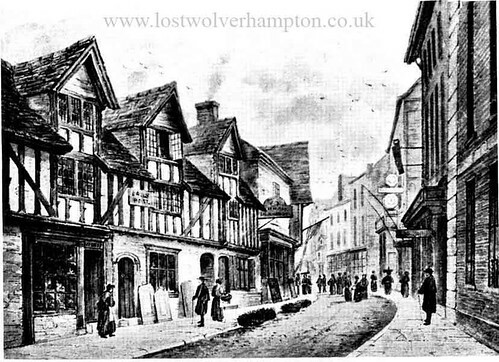 as a Spectacle and Tobacco box maker in Oxford Street Wolverhampton. Secondly, as I’ll explain later, I have been terribly short sighted throughout my life until 2 years ago when I had cataracts removed from both eyes; What a Joy! 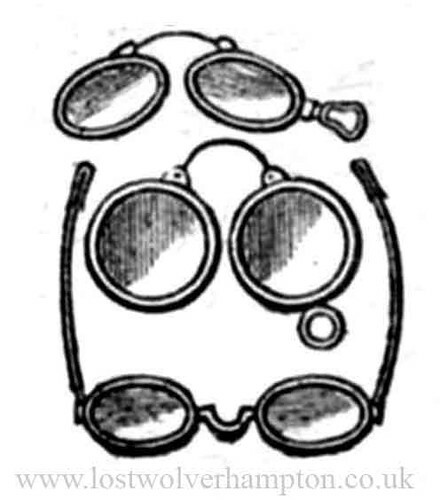 Early Spectacle frame maker Wolverhampton. 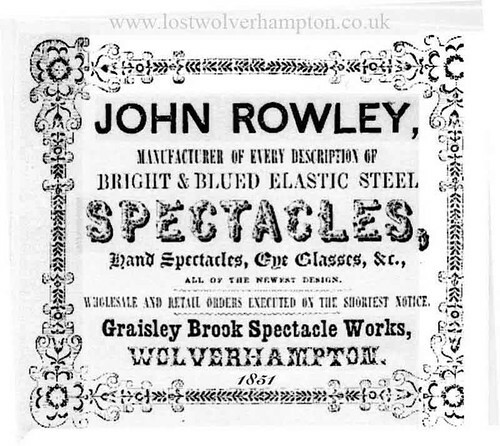 The earliest mention of a spectacle manufacturer in Wolverhampton I have found is in the Staffordshire Directory from 1818. There were ten Spectacle case and Tobacco box makers, and six spectacle frame makers, some of which also made lenses. The earliest Directory I discovered which actually included named opticians amongst the frame makers, was from 1856 and it included this gentleman – John Rowley of Lewis Street, close to his Graisley Brook Works. 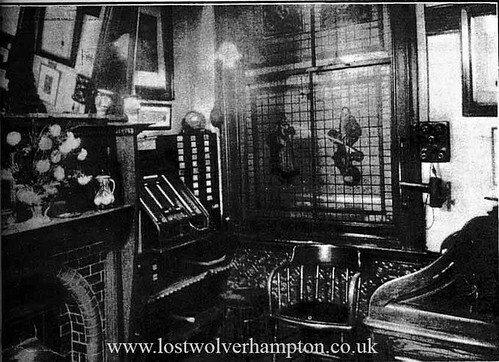 Now I think in this day and age it is amazing that the same skilled optical service can be obtained in Wolverhampton on the same site 150 years after it came in to practice. I am referring to the opticians at 44 Lichfield Street. There was a magazine article on care of the eyes written in the 1920’s, regarding the reckless manner in which some people take chances with their sight. Now I personally don’t believe they started their long time business actually here in Lichfield Street. Perhaps the date 1863 for their commencement in business is correct but the location of Lichfield Street, could be out. The first mention I have found of them in any directory is five years after the said commencement, and they are listed at 3 Graisley Street in the Staffordshire Directory in 1868. Old Lichfield Street circa 1863. Now, it is possible they spent the first five years of their existence here in Lichfield Street until moving to Graisley Street, but I doubt it. These buildings were on their last legs in 1863, and in 1881 all these houses and shops were pulled down under the artisans scheme. And if further proof is needed… In August 1883 the first shop was opened in the new Lichfield Street; the one we know today. Blackhams Letterhead. Blackham late of 64 Queen Street. 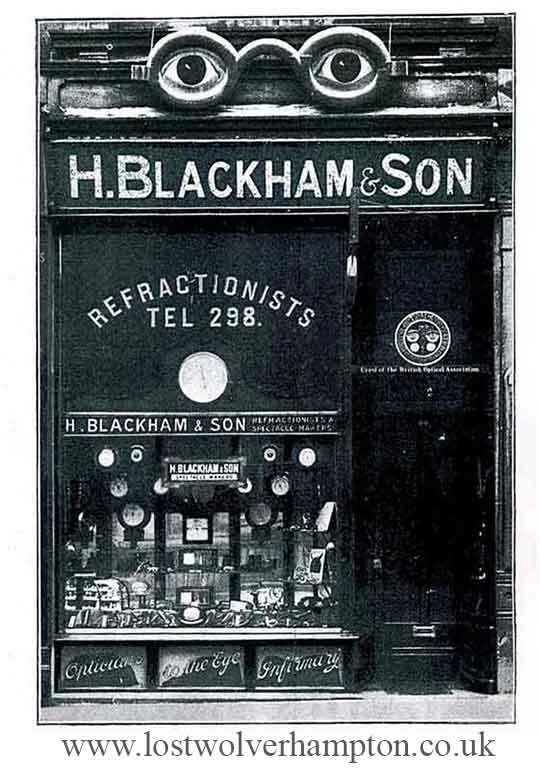 This advert for H. Blackham appeared in Alfred Hindes Directory the following year 1884, stating at the bottom right they are late of 64 Queen Street.. I think this proves they have been in existence 150 years and in the same premises in Lichfield Street 130 years, which I must say is some accomplishment. 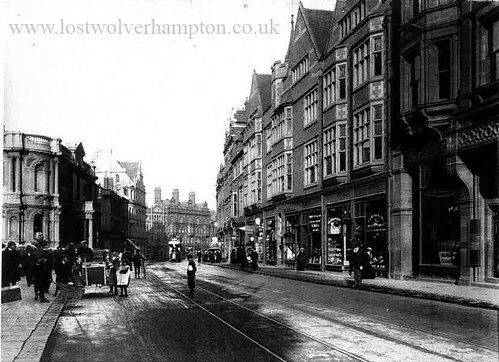 New Lichfield Street circa 1920. By the end of the first World War This opticians founded by the then late Mr Henry Blackham had grown to be the largest organisation of its kind in Wolverhampton. 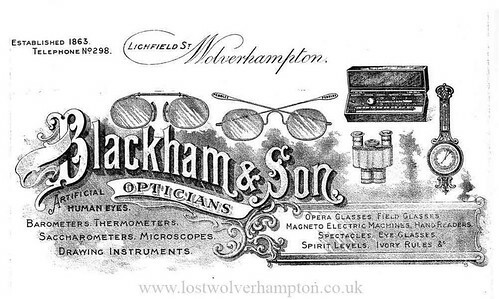 In addition to having this large private practice Messrs Blackham were also opticians to various important public bodies including the Wolverhampton Eye Infirmary and the Education committee of Wolverhampton, Bilston, Coseley, and Cannock. They were also registered to the National Health Insurance Scheme, and had the distinction of being modern in every way and fully equipped for sight testing by the most up to date methods. This I can vouch for first hand. When I first started senior school at the age of Eleven years, being tall for my age, I always tried to sit at the back of the class. The problem I had with that was I found it difficult to read what was on the Blackboard some ten feet away never realizing then that I was very short sighted. Bluffing my way during lessons often caused the teachers to think me disinterested and it was only after a visit to the school by optician Mr Blackham in 1948 that my problem was resolved. When testing my eyes he said he was amazed that I could see the board, never mind what was written on it. I’ll never forget his words to me when I called at Lichfield street to pick up my first pair of glasses. “William,” he said. “Put these new spectacles on, Now you are about to see the patterns on wallpaper for the first time.” – How right he was! In the first edition of The Midland Counties Evening Express for Wolverhampton dated Monday November 2, 1874 there is an advertisement on Page 1 for H. Blackham, 61 Snow Hill, Wolverhampton. Has for inspection a Large Assortment of SPECTACLES. 6s., and 8s. per pair, WITH CASE. and slides; Microscopes, and other Optical Goods. by the Express and Star. from Snow Hill to Queen Street then on to Lichfield Street. My interest in your website is as a consequence of discovering that my ancestors were spectacle frame makers in Wolverhampton, James and his son John Newman. James was in1861 living inGreat Brick Kiln Street and John appears as a retired spectacle frame maker in 1915 living in Cannock Road. Was the work skilled and well paid? Nice of you to get in touch Patrick my interest in the subject of Spectacle’s came about through family History, I would say the making of the lens would have been the most skilled but the frame makers and box makers were then and still are in great demand. If I lern more on this subject I will post it on our forum and facebook group.